Zopim, now Zendesk Chat, is a live chat solution that helps businesses increase sales conversion by engaging important leads on their websites. The analytics.js Zopim Destination is open-source. You can browse the code on GitHub. NOTE: Zendesk Chat currently offers two types of widgets: a standalone Chat Widget, which is mainly designed to provide chat related features, and a Web Widget, which incorporates both Zendesk Chat and Zendesk Support functionalities. At the moment, Segment only supports the Chat Widget. For more details refer to the “Getting Started” section below. This document was last updated on June 11th, 2018. If you notice any gaps, outdated information or simply want to leave some feedback to help us improve our documentation, please let us know! The first step is to make sure Zopim supports the source type and connection mode you’ve chosen to implement. You can learn more about what dictates the connection modes we support here. Search for “Zopim” within the Destinations Catalog and confirm the Source you’d like to connect to. In about 5-10 minutes the CDN will be updated and Zompim’s snippet will be initialized onto your page. When you call identify, the name, email, and phone traits included in the call will be set to the current user in Zopim. 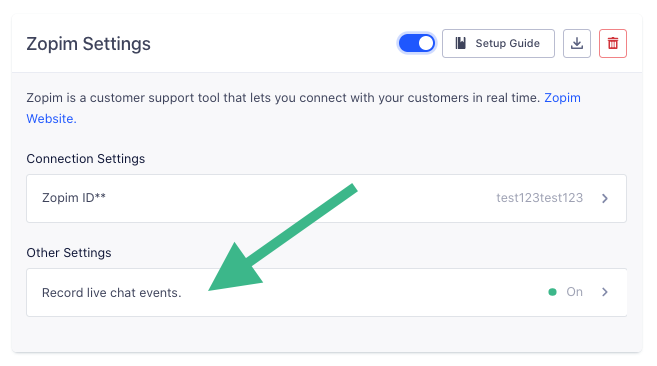 These events will then flow out to your other tools, so you can do things like analyze if users who chat spend more money over time. To learn more about the live chat events you can capture with this destination, head on over to our Live Chat spec docs. I want to hide the Zopim widget on certain pages, or after a analytics.js call is made.